“Relics of the Old Republic,” continues the story begun in “The Lost Commanders,” starting in media res shortly after the destruction of the Imperial probe droid. 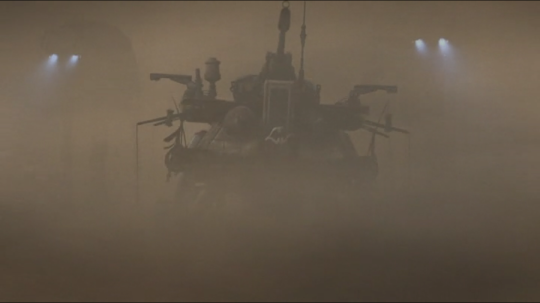 It exchanges the beautiful horizon based shots of the clones’ tank against a blue sky and salt flat-like surface with the claustrophobic confines of a blinding sandstorm. In both instances, the result is visual beauty. 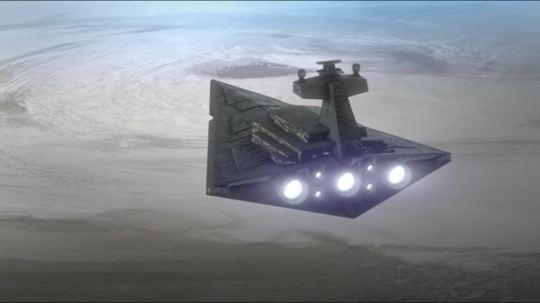 For both episodes, Hera and Chopper have remained in orbit, working to fix a problem on the Ghost and silent observers to the presence of Kallus’ star destroyer under the command of Admiral Constantine. Set on the figurative sidelines of the story, they play as much a role in the events on the surface of the planet as does the viewer. That’s all right, because there’s more than enough players on the stage below as events begin to evoke very fond memories. In the clones’ home on the range, Wolffe finds himself the unhappy recipient of a call from Kallus, following up on the transmission he sent out in the last episode. Incredibly unconvincingly, Wolffe tries and fails to dissuade the Imperial of the presence of the rebels, a fact that Kallus smirkingly dismisses by sharing footage of the rebels on the tank. Having stirred up the nerves of his prey, Kallus opts to capture the rebels with a ground assault. It’s one which comes with a very familiar pound stomping. One of the most clever shots in The Empire Strikes Back occurs at the beginning of the Battle of Hoth, when rebel soldiers are informed the Empire is about to attack their snow covered base. The soldiers jump into trenches and stake their stations behind giant turbo laser canons and gaze outward onto the horizon, the air thick with anticipation and dread. Then something is spotted on the horizon and an ominous thumping sound accompanies it. We are given a view through a rebel’s binoculars and what we see at first is almost incomprehensible, four metal legs. 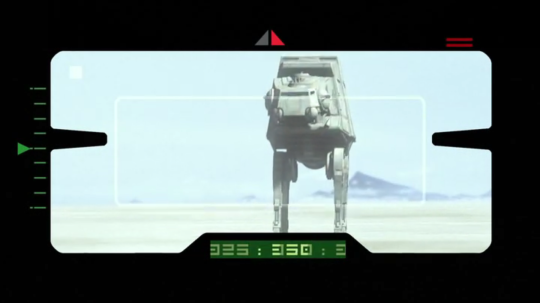 The binoculars quickly zoom back and reveal a giant mechanical walker, and in an instant, the director has gifted us with a wonderful sense of scale for the Imperial AT-AT walkers. That shot is nearly replicated in “Relics of the Old Republic,” when the rebels realize that they are about to be attacked. Kanan’s instinct is to escape in the Phantom, get the information on hidden bases and hideouts to the Rebel Alliance, because after all, he doesn’t trust the clones. 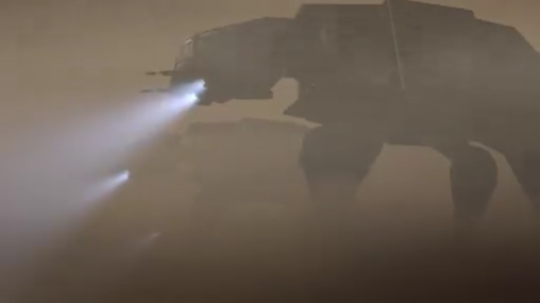 Unfortunately, the only hope for the rebels to survive the AT-AT assault is to escape into an oncoming sandstorm, which will render flight an impossibility. At approximately this point, Captain Rex begins to make more than a couple comments which reflect something of the Old Republic – the working relationship between the Jedi and the Clones. We receive a passing reference to Anakin Skywalker, figuratively “betrayed and murdered” by Darth Vader years ago, and an honest sense that Rex is a true believer in the Jedi Order. It evokes nostalgia when it really shouldn’t. Should we have that much emotional attachment for the events of the Clone Wars television show? Perhaps we shouldn’t, but so well executed that show was, we cannot help but swept away on Rex’s own remembrances and it only adds to the excitement as we get to see clones and Jedi back in action once again. Kallus, undeterred by the rebels escape into the sandstorm orders his three AT-ATs in after them. To his credit, under his command, the walkers manage to keep pace and even surround the clones’ tank. The rendering of the walkers marching in line in the midst of the storm, fading in and out of sight with bright search lights piercing the sandy veil is beautiful. The Imperial walkers become like specters hunting the rebels, and their hunt might have been successful if not for presence of Kanan and Ezra. Using the Force, Kanan guides the tank into a position where it will have a chance to fire upon the only weak spot of an AT-AT, its neck. Under Kanan’s command, Ezra is sent out into the storm to man the tank’s main cannon (let’s not discuss the odd lack of practicality of a tank which requires an individual to be on the “outside” to fire it). cannon echoes Luke Skywalker’s trench run on the first Death Star. While we do not get Alec Guiness’ wise voice speaking out of the ether, Ezra makes the decision not to use the targeting computer on the cannon, just like Luke. Relying on the Force, Ezra fires the canon just at the right moment to successfully hit an AT-AT. The walker goes down and the rebels and clones make a dash out of the storm, pursued by Kallus’ two remaining walkers. Free of the flying sand, the Phantom shuttle is finally able to fly, and Kanan makes the quick decision to escape while they can and to leave the clone troopers to their fate. It’s a decision the clones are fine with, they were, “born to fight,” and the scene is haunted with old warriors who recognize that their time has finally come and have made their peace with their end. It seems this would be the end of Captain Rex, Wolffe, and Gregor, and as the Spectre flies away, the trio make a nearly suicidal run on the walkers, managing to ram Kallus’ own with the tank, all the while taking serious damage. Thankfully for them, Ezra pushes the issue with Kanan, arguing that they must go back to save them and Kanan finally agrees. In a spectacular assault, our Jedi and Jedi in training, accompanied by Zeb, drop from the shuttle onto the top of an AT-AT and quickly use their lightsabers to gain entrance. Zeb removes the pilots of the walker from the equation and in short order, Kallus finds his AT-AT under attack and knocked out of commission. The clones are saved, maybe not their home on six legs. What follows is the return of the rebels to the rebel fleet, where we learn the clones opted to return to the fight. 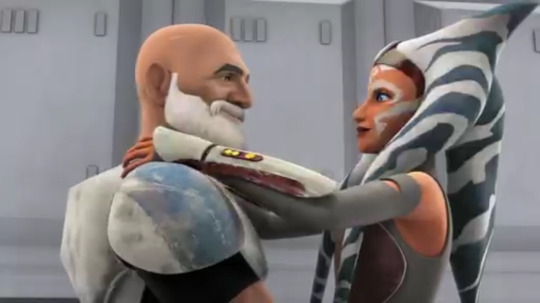 The result is a touching moment when Captain Rex and Ahsoka Tano meet again for the first time in a long while. 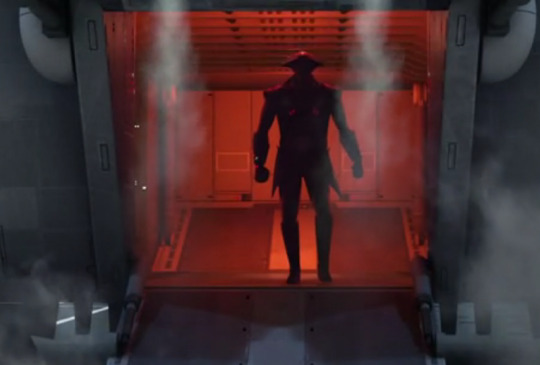 The Clone Wars have never been so present in the mind of the viewer and so represented in Rebels. One reason the Phantom was able to fly away and without Kallus’ care, was because the major believed that Admiral Constantine and his star destroyer would surely catch the fleeing rebels. Unfortunately, Kallus was unaware that the admiral had been called away to rendezvous with Darth Vader; as Hera noted while watching the Imperial capital ship blink away into hyperspace, “That’s either really good or really bad.” For our heroes, it may prove the latter, as we are introduced to a new Inquisitor who arrives with as much a chilling presence as the last and with promises to capture the rebels and undoubtedly, erase the Jedi from existence. “Relics of the Old Republic,” might well be retitled, “Memories of the Clone Wars,” given how thick the nostalgia is stirred by the presence of the clone troopers and Captain Rex’s reflections on fighting with the Jedi. This is perfectly fine, so long as Rebels doesn’t turn into the Clone Wars 2.0, and the likelihood of that is definitely quite low. They are two great adventures connected, but distinct, and one is over while the other is still just continuing. The sound, the music, and the animation, continue to be superb, making Rebels one of the best animated shows on television today.